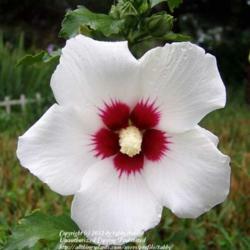 Love for hibiscuses extends literally around the world. 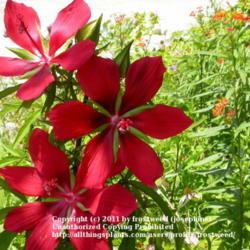 There are several hundred species in this large genus of flowering annuals and perennials. 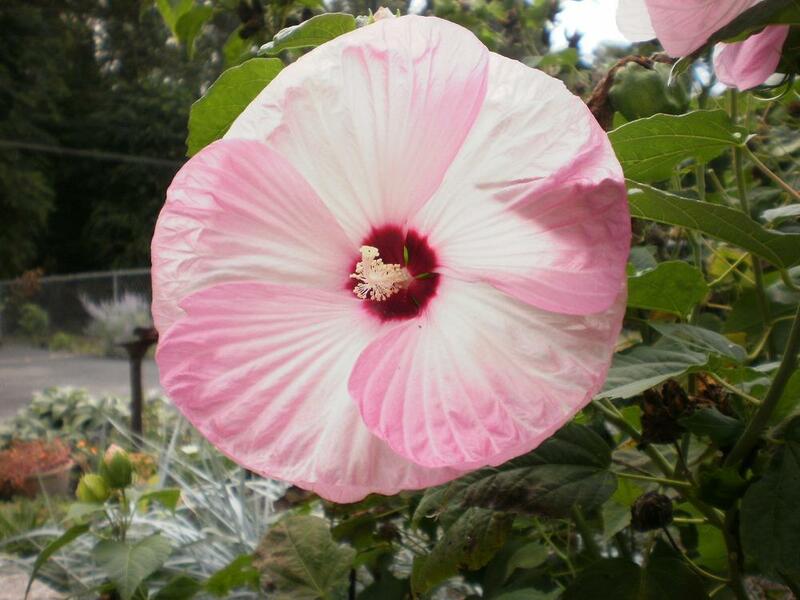 Here we'll focus on three main flower types, three species, and their distinctive characteristics. 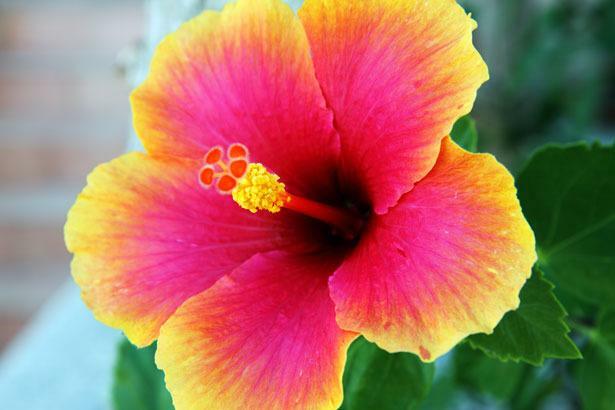 From large and flashy to small and understated, as well as everything in between, the genus Hibiscus spans the gamut when it comes to floral displays. 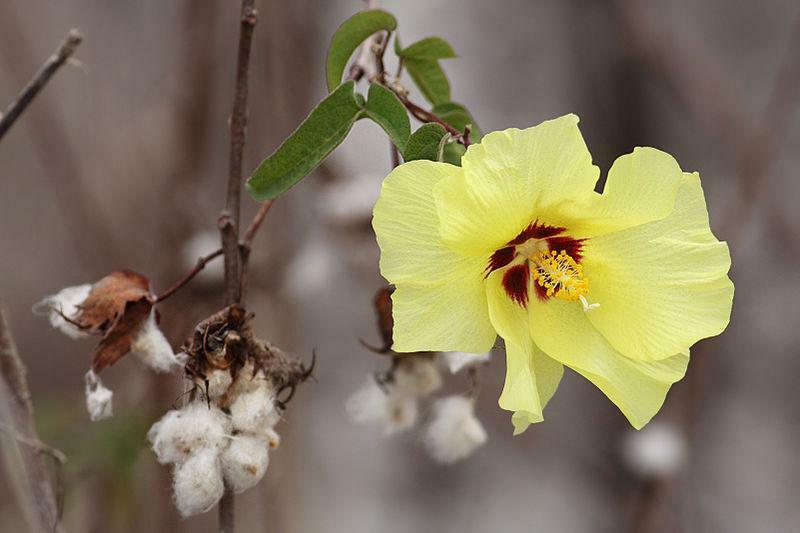 One thing is certain, it's a flower known and grown just about everywhere around the world: from Sweden where it is highly popular, all throughout the tropical and subtropical regions, to India and China where it is thought to have originated. 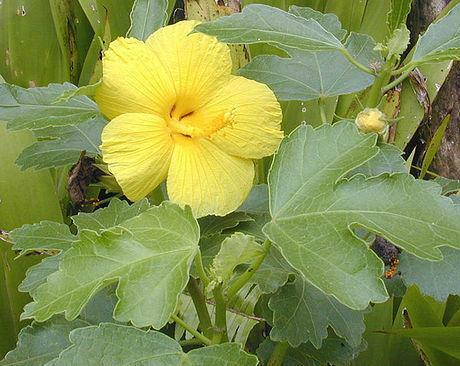 Many cultures use all parts of the plant extensively and particularly the flowers for tea as well as for eating raw and cooked. 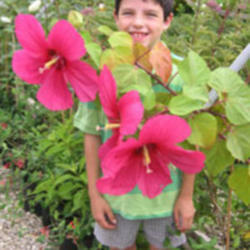 One hibiscus species is made into paper, rope, twine, and even a coarse cloth. 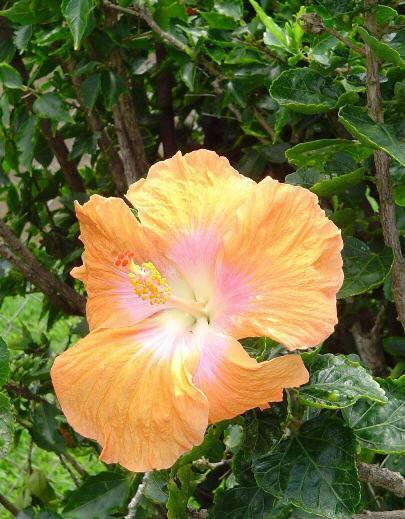 Other species are used as dyes, diuretics, shoe polish, medicines, digestive aids, perfumes and cosmetics. 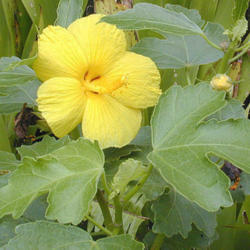 The boiled roots are put to use in some cultures to make poultices for treating skin ulcers and malignant skin lesions. 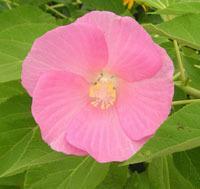 However, many of us grow hibiscuses for the beautiful flowers alone. And that's reason enough to grow and cherish this plant. 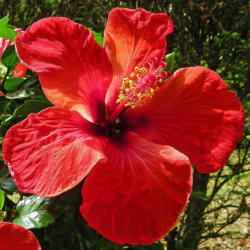 Many hibiscus blooms are nothing short of spectacular. 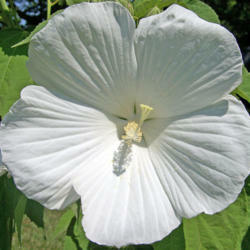 In general, hibiscus flower types fall into three categories: tropical, hardy, and Rose of Sharon. 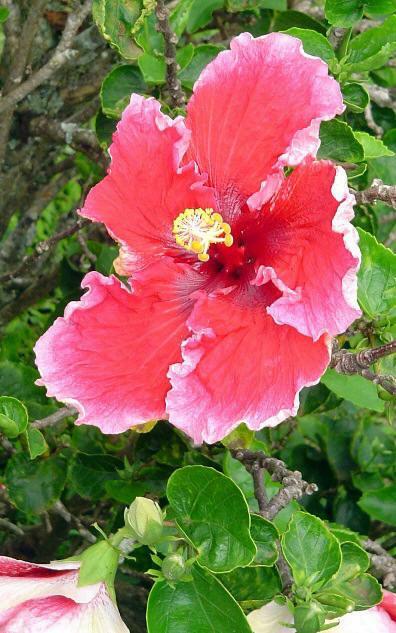 These are somewhat subjective categories since there are species like the sea hibiscus and the rock hibiscus that don't strictly match any of those types. 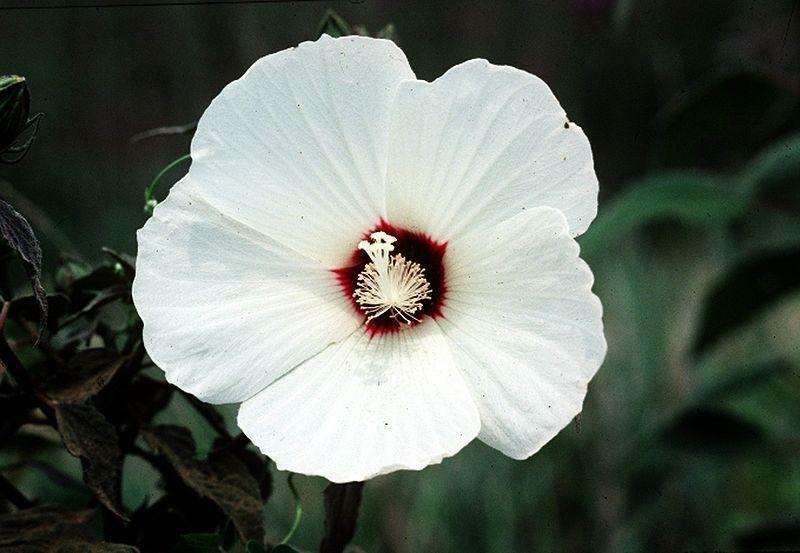 But for the purpose of this discussion, we've narrowed it down to three types of flowers and their representative species. 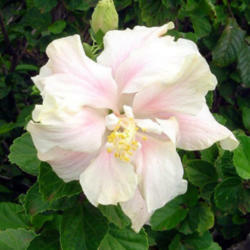 As with all species of hibiscus, tropical hibiscus (H. rosa-sinensis) belongs to the Malvaceae or Mallow family. 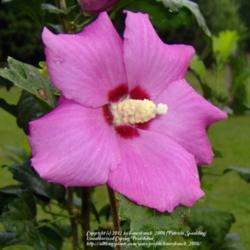 Other relatives in this family of plants include cotton, okra (Abelmoschus esculentus), and the hollyhocks. 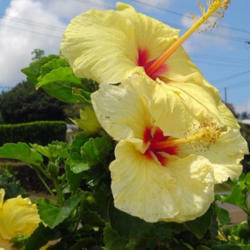 This species is the national flower of Malaysia and a native variety, H. brackenridgei, is the state flower of Hawaii. 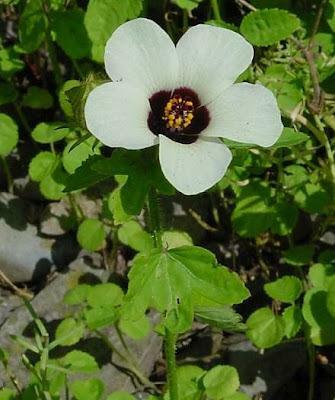 Carl Linneaus first used the name hibiscus in his Species Plantarum when describing a red double form of the tropical species he had collected prior to 1753. 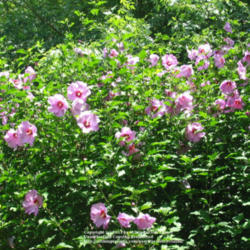 H. rosa-sinensis is a vase-shaped shrub or small tree that reaches a height of 5-12 feet and has a spread of 6-10 feet. 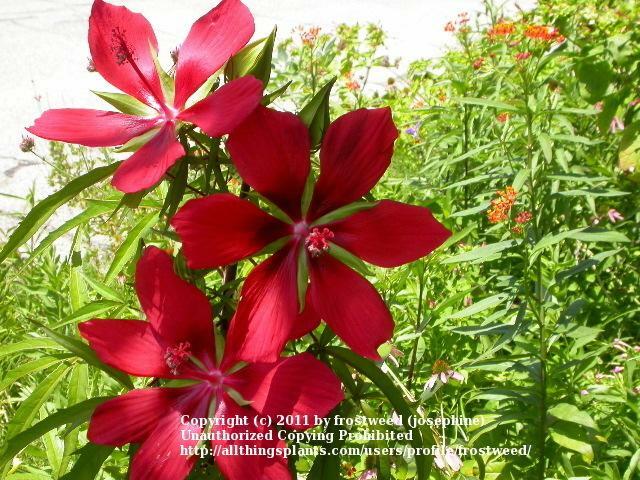 It is a fast-growing plant that is not native to the contiguous US and is hardy here only in USDA zones 9-11. 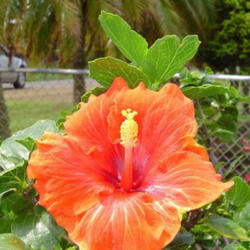 However, it is grown as a potted plant or houseplant in every state in the country. 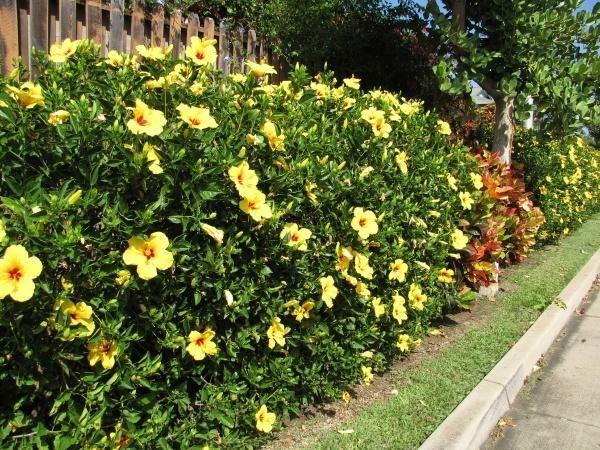 Uses include borders, hedges, mass plantings and containers. It can be trained as a standard or as an espalier. 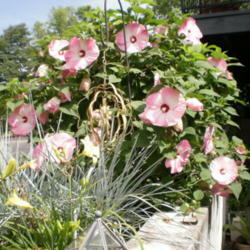 The leaves are evergreen, and the flowers attract butterflies and hummingbirds. 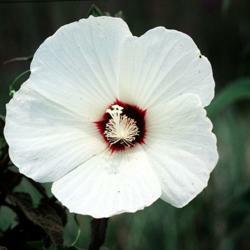 This plant grows best in full sun to dappled shade and will thrive in well-drained clay, sand or loam soils. It has moderate drought tolerance. 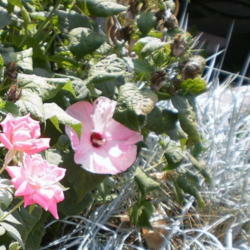 Bud drop occurs with too much or too little watering or with too much fertilization. Aphids can be a major pest for this plant but are fairly easy to remove by spraying with a hose. 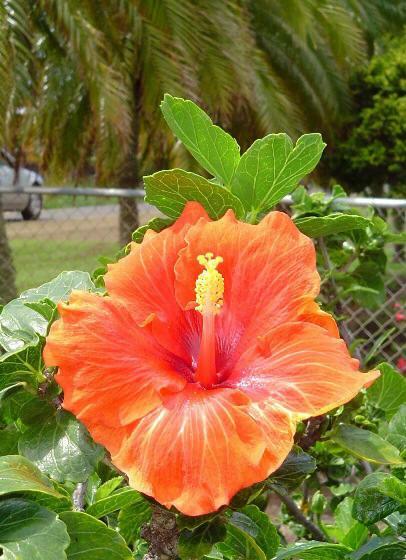 Tropical hibiscus flowers are sometimes large, can be single, crested single, double or cup-and-saucer double in form, and come in shades of orange, red, yellow, pink, salmon, lavender as well as numerous combinations of those colors. 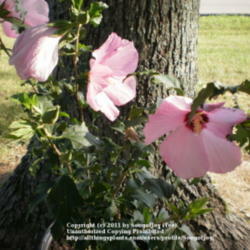 H. rosa-sinensis blooms year-round. It's said that one picture is worth a thousand words. 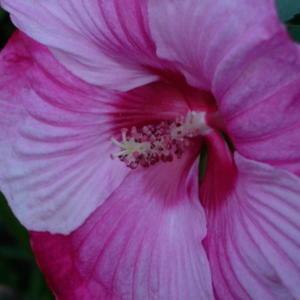 The photos below show samples of H. rosa-sinensis flowers much better than I could describe them and give an idea of the form and and some of the many color variations of the blooms. 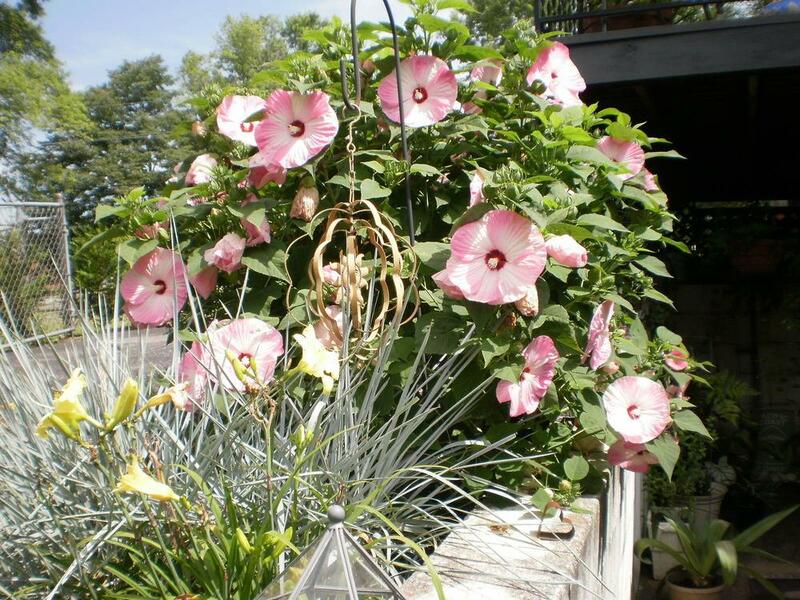 There is a group of hardy, herbaceous, perennial hibiscuses that are native to North America and are perhaps equally as showy as their tropical counterparts. This group of closely-related species is commonly referred to as rose mallows or swamp mallows because their native habitat is mainly confined to low wetlands, swamps, marshes, rivers, and low wet wooded areas. 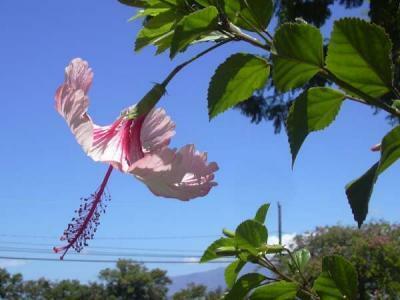 Included in the group are H. coccineus, H. dasycalyx, H. grandiflorus, H. laevis, H. moscheutos, H. lasiocarpus, and H. palustris (sometimes listed as a subspecies of H. moscheutos). 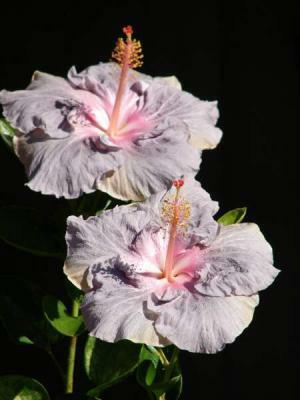 Flowers of the hardy hibiscus species are often huge but delicate in appearance, looking as if they were made out of crepe paper. 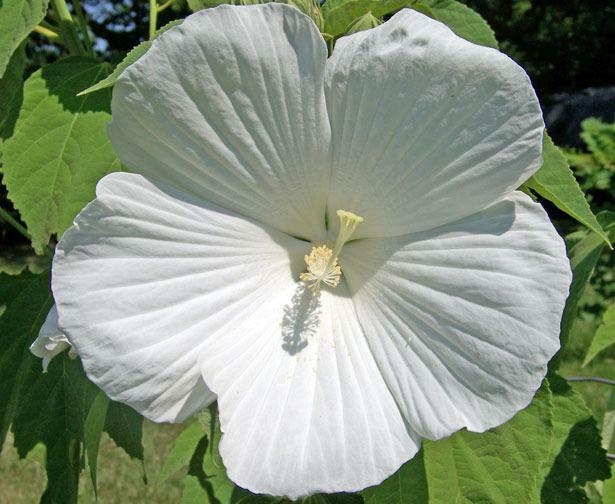 Across the hardy species, blooms can range in size from small (3 to 4 inches wide) to very large "dinnerplate" size (8 to 12 inches wide). 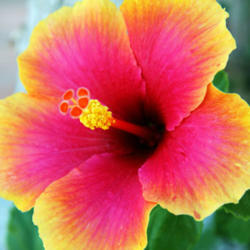 Colors include white, yellow, pink, red, hot pink, raspberry, mauve, dusty rose, and plum. 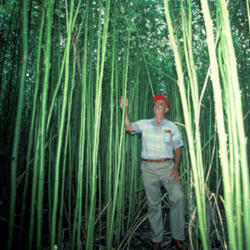 The plants themselves range in height from 3-4 feet upwards to around 8 feet tall. 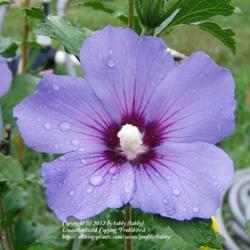 They can tolerate a wide range of temperatures and are cold-hardy to USDA zone 4 as well as reliably hardy in zone 3. 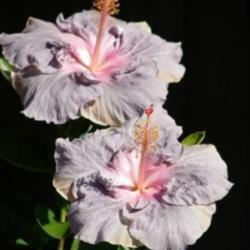 These hibiscus varieties are deciduous and have woody stems that die back to the ground in cold-winter areas. They need a minimum of at least six hours of full sun a day. Although they will tolerate a wide range of soil conditions, hardy hibiscus perform best in soil that is rich in organic matter. They like the addition of sphagnum peat moss at planting time. 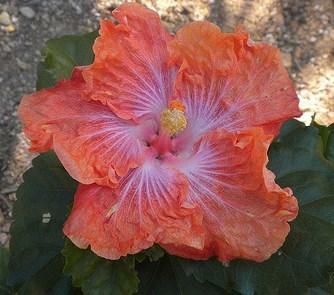 Hibiscus moscheutos (below), a species that now has many recognized hybrid cultivars, is representative of the flower form of the hardy hibiscuses. 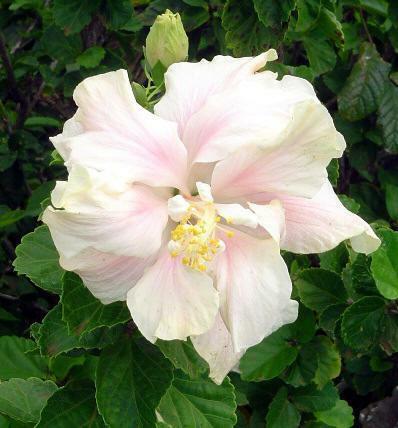 A word about Hibiscus moscheutos: Because I both greatly admire and grow this lovely plant along with H. syriacus, it saddens me to have to report the following information. 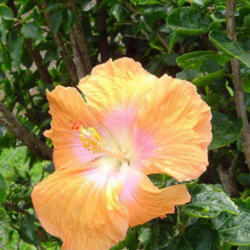 Two new strains of the tobamovirus, which have been named Hibiscus latent Singapore virus (HLSV) and Hibiscus latent Ft. 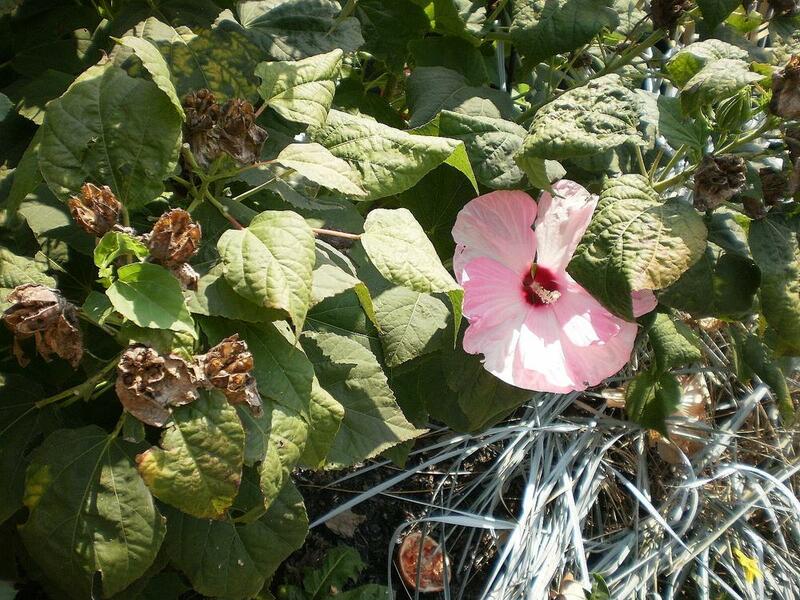 Piece virus (HLFPV) have now been identified in landscape plantings of the species H. moscheutos, H. rosa-sinensis, H. coccineus, and H. syriacus. 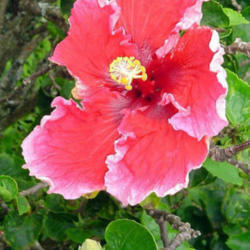 The former was found in H. rosa-sinensis in Singapore and the latter was first discovered in plants in Florida. 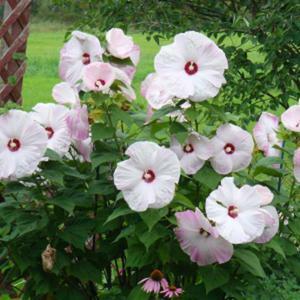 There is no remedy for these viral diseases, and they are believed to kill the majority of infected plants within a few years. 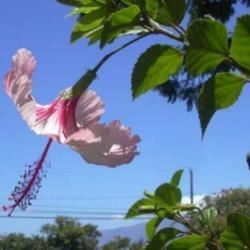 Most people I've spoken with have been unaware of the existance of these hibiscus viruses. 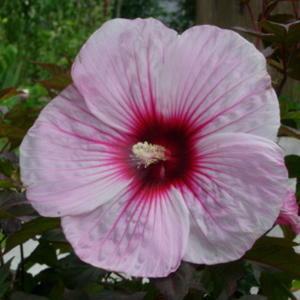 It now becomes very important to inspect any potential purchases carefully as well as to source H. moscheutos and some of the other hibiscus species from trustworthy and disease-free growers. More information can be found here as well as elsewhere on the internet. 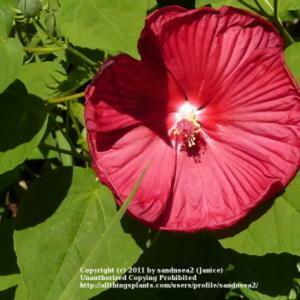 Another virus known as Hibiscus chlorotic ringspot virus (HCRSV) can be readily passed between several genera of the Malvaceae family as well as between several different plant families. 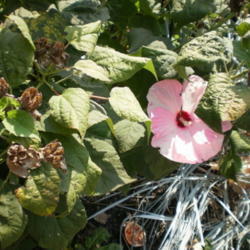 While not usually quickly fatal to hibiscuses, this virus causes ringed yellow spotting of the leaves and infected plants should be burned. 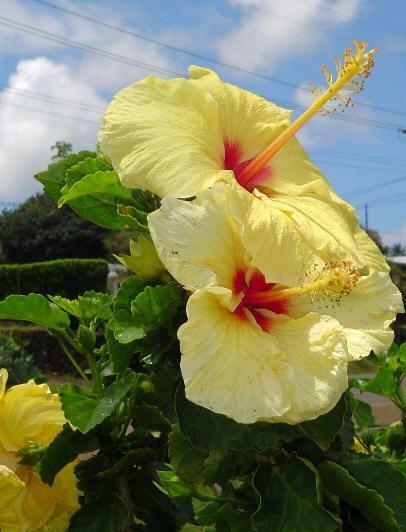 There are no known insect vectors, but the virus has been found to be easily transmitted by mechanical means such as pruning shears and grafting. 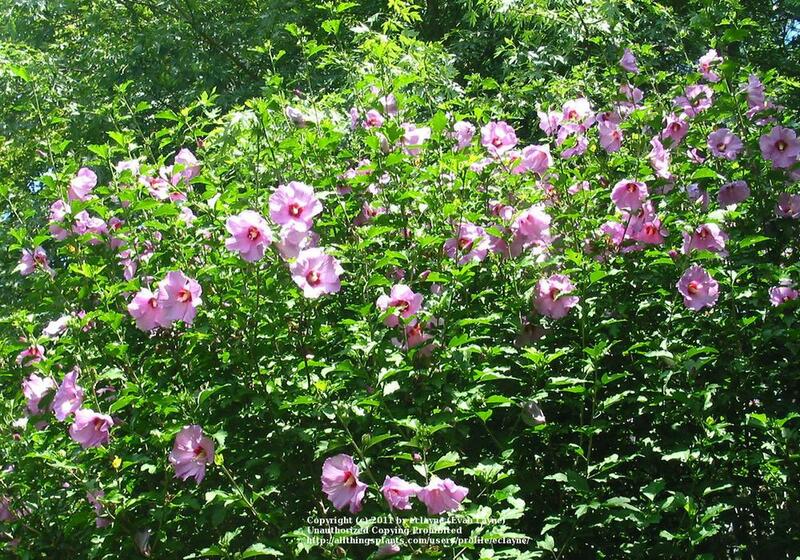 Hibiscus syriacus, a hardy perennial shrub, is known by several common names including Rose of Sharon, Althea, Syrian Rose and Hardy Hibiscus. 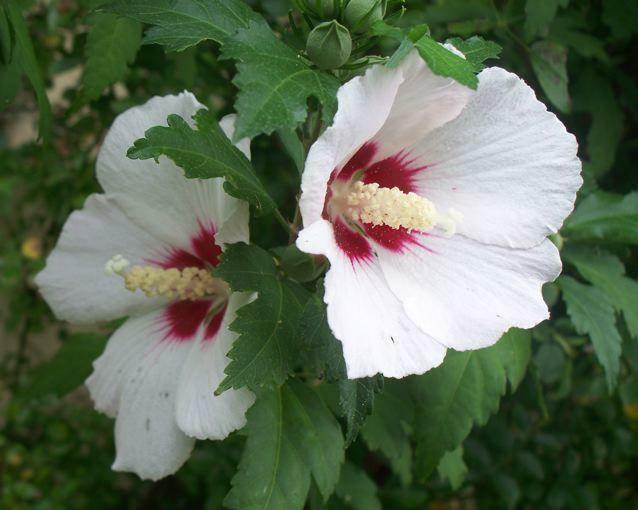 Since before Korea's recorded history, it has been known and grown in that country where its flowers are eaten and its leaves are used to make a tisane. 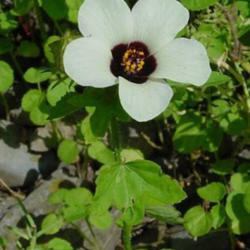 It is the national flower of South Korea. 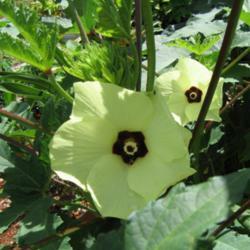 This plant is easy to grow and is fairly easy to propagate from both seeds and cuttings. 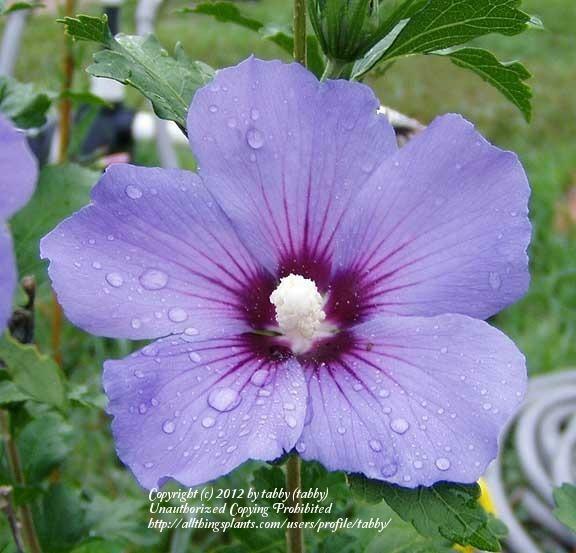 It is hardy in USDA zones 5-8. The soil requirements are variable across a wide range of soil types as long as drainage is good. 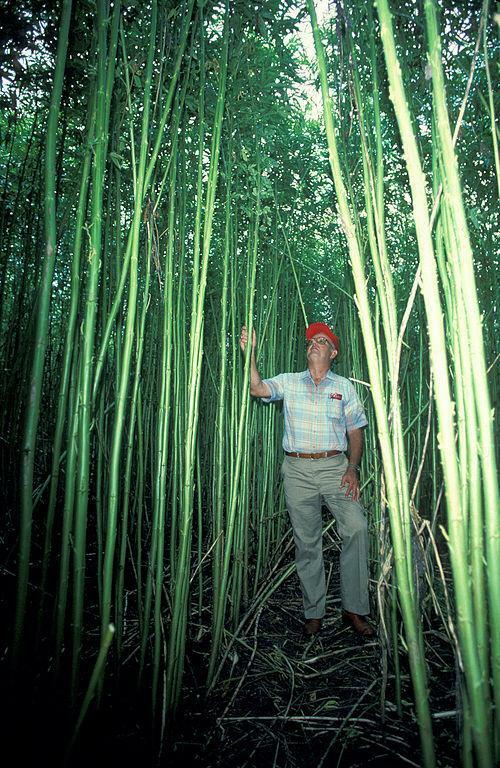 It can, however, also easily become invasive under the right conditions due to the large number of seed capsules produced each year. 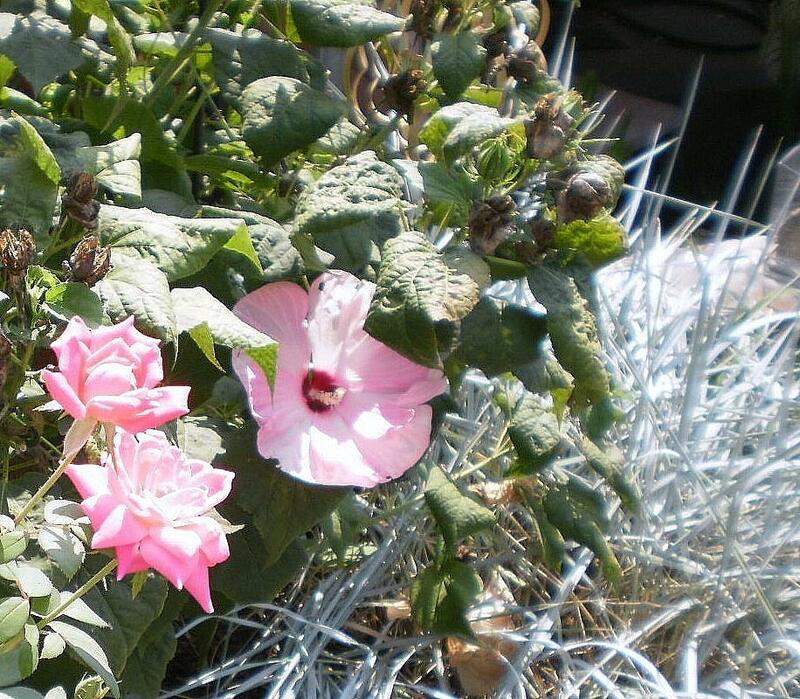 Cut them off to prevent the plant from spreading. 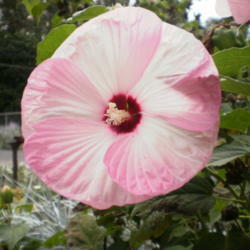 The newer triploid cultivars such as 'Aphrodite', 'Helene' and 'Minerva' produce few, if any, seed pods. 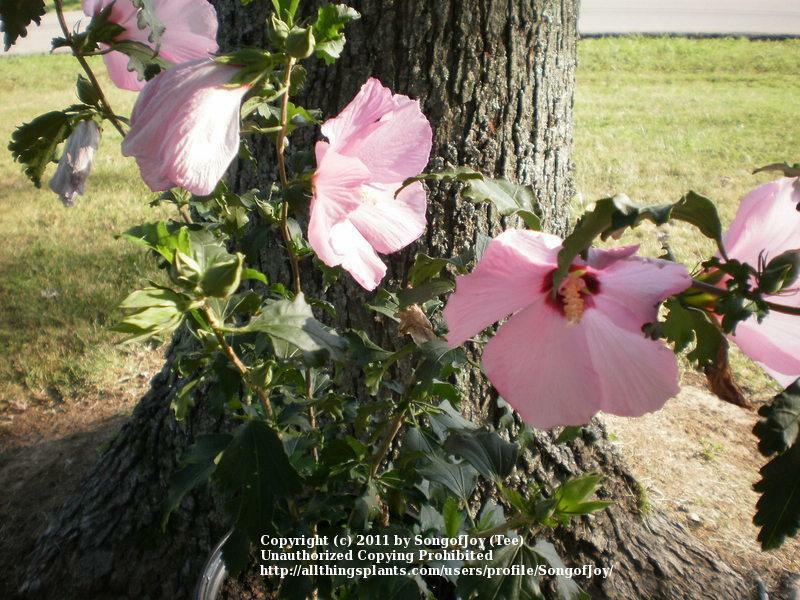 Rose of Sharon is somewhat drought tolerant and is also tolerant of air pollution. 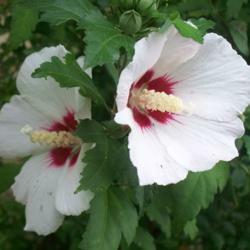 It enjoys full sun and blooms best in hot and sunny conditions but can tolerate part shade. 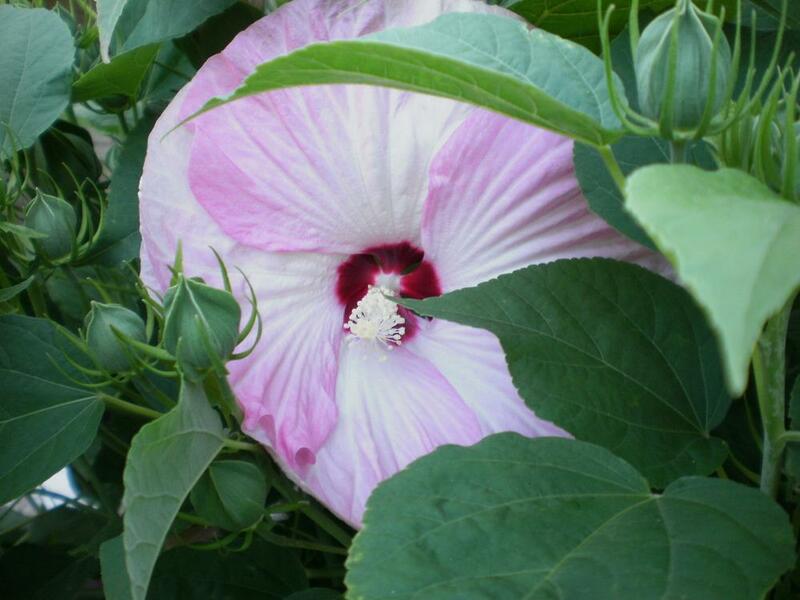 In colder climates, it benefits from winter mulching, especially the first three years while becoming established. 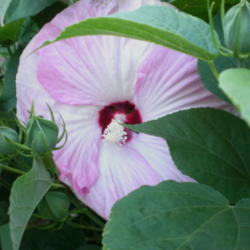 H. syriacus grows 8-12 feet tall and 6 feet wide with a vase shape. 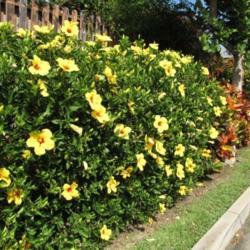 It can be grown as a hedge or trained into an espalier. It can even be used as a bonsai plant. 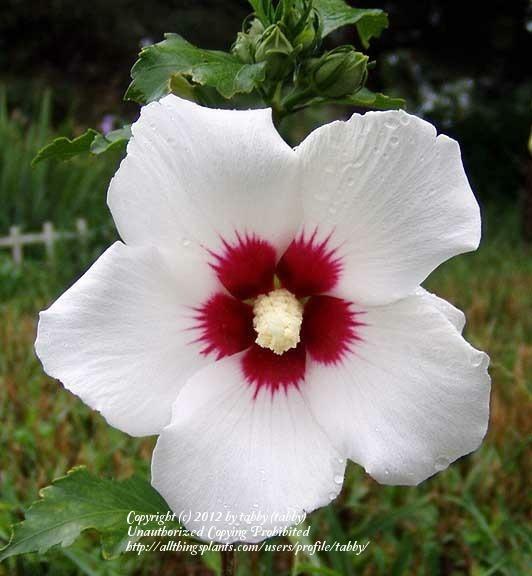 Flowers are 2-5 inches wide and come in shades of white, pink, red, purple, blue and violet. The flowers often have a different color spot in the center of the throat. 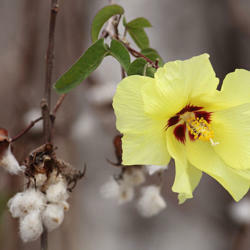 The leaves are slow to break dormancy in the spring and the plant is a late bloomer. 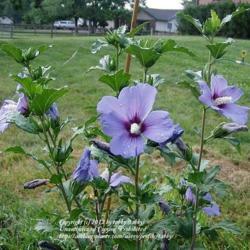 It is not recommended for use as a specimen plant. 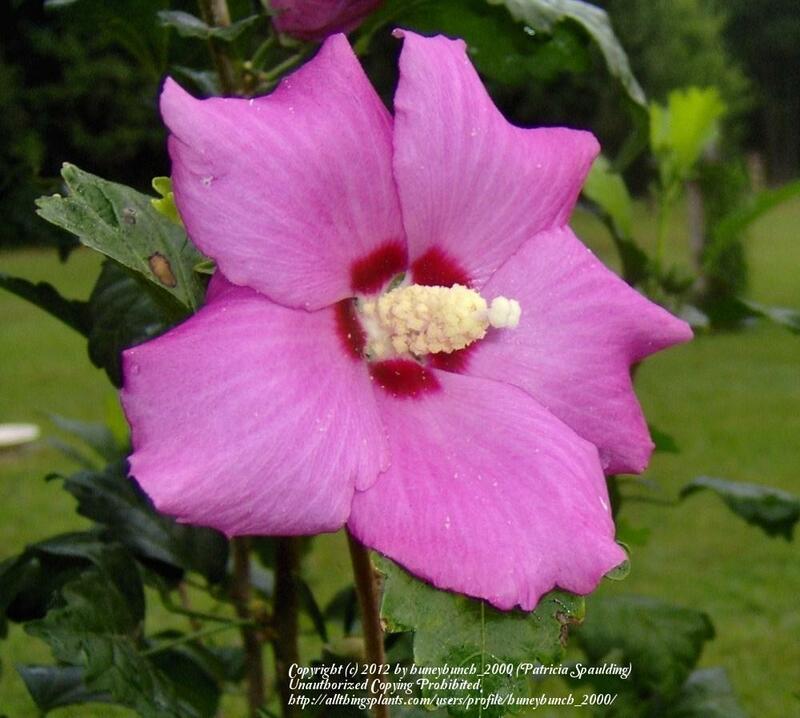 Studies conducted at Tufts University have shown that tea made from the flowers of the Hibiscus species H. sabdariffa L. (True Roselle), in particular, is beneficial to people with several medical conditions. Besides being rich in antioxidants, hibiscus tea was shown to reduce blood pressure in both pre-hypertensive and mildly hypertensive stages in adults. 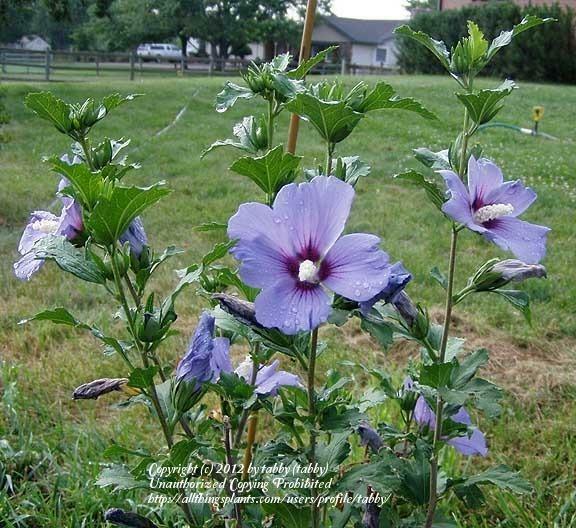 It has also been shown to have anticholesterolemic properties. 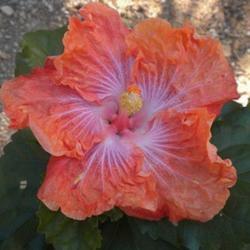 In the world of flowers, Hibiscus definitely isn't just another pretty face. Please scroll over the images to view their sources.